Description: In parts of Africa, the traditional technique for building basic housing involves burning clay bricks in a kiln, requiring significant wood consumption and resulting in deforestation. The French-Swiss cement manufacturer LafargeHolcim has an alternative: they claim that their new earth-ciment ‘DuraBric’ releases 1/4 of the CO² of concrete blocks and 1/10 of that of burnt bricks. The presence of cement (5-8%) in DuraBric means no need for burning and offers increased durability and insulation, according to LafargeHolcim. 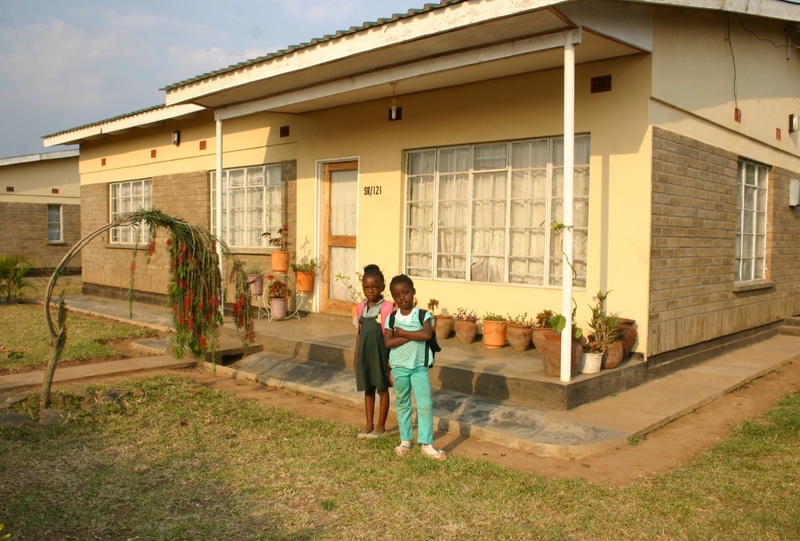 Via their Affordable Housing programme, which has beneficiaries in 18 countries, the company has used DuraBric in the construction of a school in Lilongwe, Malawi, and another is being built in Mbeya, Tanzania. The company is now constructing a factory in Lilongwe capable of producing 10,000 DuraBric per day. Why do we love it: An innovative building material that’s affordable, durable and helping to combat deforestation! Can you summarize DuraBric in one sentence? Produced from a mix of earth, sand and cement, DuraBric blocks are an alternative to the traditional earthen brick, which has to be fired in a kiln. Using DuraBric means avoiding this firing phase, thus reducing the carbon footprint and the cost of the bricks. Where did the inspiration for the DuraBric come from? The idea for DuraBric was born in Malawi and came from an observation we made there. We were working on how to help local public authorities find a way of building that avoided using wood, while at the same time being affordable. How do you see the future of this project? More than 2 billion people live in earthen houses and could therefore be interested in this solution, which combines the traditional aesthetic of earthen construction with an innovative technique that reduces the cost of construction as well as its carbon footprint. On a sunny hill overlooking a valley of shrubs, yellow grass and maize, Deodat Madembwe watches a team of masons make bricks for an elementary school he’s building. As a young man growing up in central Tanzania, Madembwe too was a mason. Back then the most popular way to make bricks was to mold them loosely out of dirt and clay and then burn them in a tanuru—the Swahili word for a kiln. But to heat the kiln was to wreak havoc on the local environment. “People cut trees to burn bricks,” he explained. To burn enough bricks for about five houses, they’d have to fell 10, even 20 trees. Burning the trees releases CO², contributing to climate change, and deforestation means there are fewer trees left to combat it. As Tanzania’s population grew, more and more houses arose and the landscape suffered. “We [were] making a desert,” said Madembwe. But today, on a sunny plateau above Mbeya, the masonry unfolding before Madembwe’s eyes is of an entirely different breed. Two men with shovels quickly mix dirt they’ve sifted with a bit of sand and cement. They add water and shovel the mixture into a small steel device. A third man closes the heavy metal lid and pulls down hard on a long green lever. He releases, and a perfectly rectangular gray brick rises up. 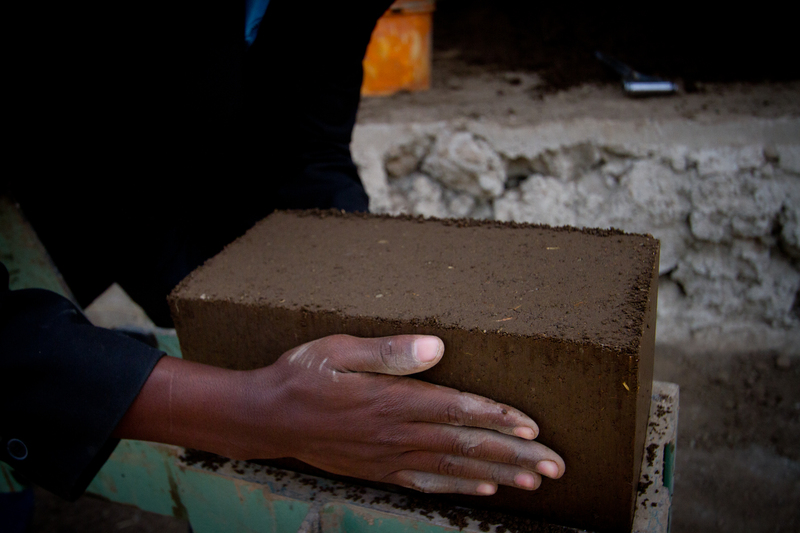 NGOs, governments and local cooperatives have been experimenting with so-called compressed stabilized earth blocks (CSEB), a green alternative to tree-consuming burnt bricks, on a small scale for years. But they may soon rise to global prominence, prompted in part by interest from an unlikely party: the largest cement manufacturer in the world. The French-Swiss company LafargeHolcim is betting on a product it calls the DuraBric as part of its global push to expand affordable housing. 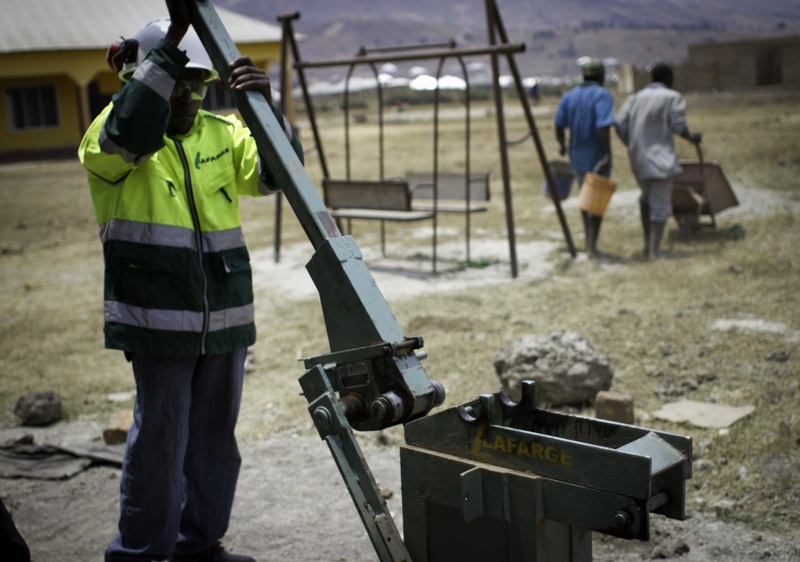 Since 2013 they’ve distributed nearly a dozen hand-operated brick presses around the dusty town of Mbeya, Tanzania, as well as in Rwanda, Cameroon and Zambia. The devices cost about US$2,000 each to manufacture, but the company lends them out for free on the condition that users fill them with LafargeHolcim brand cement. The process that led to the creation of the Durabric started with an experiment that didn’t work as planned, explained François Perrot, who heads the company’s global affordable housing program. A few years back the company introduced a low-cost plaster product in India designed to hold mud houses together. But it didn’t sell—people preferred to build new houses with bricks rather than protect their old ones with plaster. Noting this preference, researchers at LafargeHolcim’s R&D lab in Lyon, France, began testing ways to mix cement and dirt for bricks. Around this time, a continent away, a delegation of government officials in Malawi approached LafargeHolcim looking for a greener alternative to the burnt bricks that were contributing to their country’s deforestation. Suddenly LafargeHolcim had a market for its earth-cement recipe. It quickly furnished a prototype of the brick press and used it to build an NGO-funded school in Malawi’s capital. When done right, earth bricks are stronger and more weather-resistant than burnt clay ones. Studies have shown that using soil-stabilized bricks to build a home or school can save 20 to 30 percent on the project’s overall cost. What’s more, because the bricks are perfectly uniform, homebuilders need to use far less mortar to fill the cracks, and often decide not to plaster the outside of the house. This reduces the amount of cement, the manufacture of which is responsible for around 5 percent of global C0² emissions. LafargeHolcim is developing a press to make interlocking bricks, which require less mortar still. Citing research by a brickmaking NGO in India, the company claims that DuraBric blocks release 13 times less CO² than burnt bricks. And it estimates that CSEB emit 20-25 percent the CO² of concrete blocks. “It’s a combination between affordable and sustainable,” said Perrot. The cost reduction is a draw for local builders, and he said the environmental benefits are attractive to NGOs. Meanwhile Perrot’s team is working to persuade local government officials to promote the use of DuraBric blocks in public construction projects. Still, there are challenges. Masons who have spent their entire lives building homes the burnt-brick way must be persuaded and trained to use the machine, and with careful attention to detail: an incorrect ratio of soil to sand to cement can weaken the brick. As we visited DuraBric sites around Mbeya, we encountered piles of bricks left out to dry in the sun that should have been covered by tarps instead—a crucial step that ensures the bricks retain moisture and properly set. Drop one of these sun-dried bricks from waist height and it disintegrates back into dust. Even well-made bricks won’t last as long if the foundation or the roof is shoddy. “A brick is still 90 percent soil. It can erode. That’s why you need a good roof and an overhang so it doesn’t rain directly on the wall,” said LafargeHolcim project manager Théophile Balay, who visits each of the machines on a weekly basis to nudge masons in the right direction. The DuraBric is unlikely to sell everywhere. Perrot said that in countries like Morocco people adamantly prefer cement blocks over earthy ones. But elsewhere in Africa, people are recognizing the environmental benefits of the new technique. In fact, the bricks have proven so popular that LafargeHolcim is constructing a factory in Lilongwe, Malawi’s capital city, to manufacture them en masse—as many as 10,000 per day, or enough for two homes. Dans le monde entier, des arbres sont abattus pour faire cuire les briques qui serviront à la construction d’habitations. Pour le leader mondial des matériaux de construction, il existe une meilleure solution. Au sommet d’une colline ensoleillée dominant une vallée parsemée d’arbustes, d’herbe sèche et de maïs, Deodat Madembwe observe des maçons en train de fabriquer les briques qui lui serviront à bâtir une école élémentaire. Madembwe a grandi en Tanzanie centrale, où, jeune homme, il a exercé le métier de maçon. À l’époque, le processus le plus répandu de fabrication des briques consistait à les modeler grossièrement à partir d’argile et de terre, avant de les cuire dans un tanuru— le mot désignant un four à céramique en swahili. Cependant, faire chauffer un tel four avait un impact désastreux sur l’environnement local. « Pour faire cuire les briques, les gens coupaient des arbres, », explique-t-il.« Ils débitaient 10, voire 20 arbres afin de faire cuire une quantité de briques suffisante à la construction de cinq habitations. Brûler des arbres provoque des émissions de CO², contribuant au changement climatique, et la déforestation réduit le nombre d’arbres restants pour le combattre. À mesure que la population de la Tanzanie continuait d’augmenter, la construction de logements a connu un essor significatif, ainsi que son impact néfaste sur l’environnement. « Nous avons créé un désert » ,déclare Madembwe. Mais aujourd’hui, sur un plateau ensoleillé surmontant Mbeya, sous le regard vigilant de Madembwe, on pratique un type de maçonnerie d’un tout autre genre. Deux hommes portant des pelles mélangent rapidement de la terre préalablement tamisée avec du sable et du ciment. Ils y ajoutent de l’eau, puis la mixture est engouffrée par pelletées dans une petite machine en acier. Un troisième individu referme ensuite le lourd couvercle métallique et tire avec fermeté sur un grand levier vert. Enfin, une brique grise parfaitement rectangulaire apparaît lorsqu’il le relâche. ONG, gouvernements et coopératives locales effectuent depuis des années des essais à petite échelle avec les blocs de terre compressée stabilisée (BTCS), une alternative écologique aux briques cuites dont la production impose une grande consommation de bois. Les BTCS pourraient bientôt cependant passer sur le devant de la scène internationale, en partie grâce à l’aide inattendue d’une entreprise importante : le leader mondial des cimentiers. Le géant franco-suisse LafargeHolcim mise sur l’un de ses produits, appelé DuraBric, pour promouvoir plus avant la construction de logements abordables. Depuis 2013, l’entreprise a distribué près d’une douzaine de machines à presser manuelles pour la fabrication des blocs aux alentours de la ville poussiéreuse de Mbeya, en Tanzanie, ainsi qu’au Rwanda, au Cameroun et en Zambie. La fabrication de chacune de ces machines représente un coût d’environ 2 000 USD (soit un peu plus de 1 800 euros), mais l’entreprise les prête gratuitement, à condition que les maçons utilisent le ciment de LafargeHolcim. Pour François Perrot, responsable du programme mondial de création de logements durables de la société, le processus de fabrication de DuraBric a commencé avec une expérience qui ne s’est pas déroulée comme prévu. Il y a quelques années, en effet, LafargeHolcim introduisit en Inde un type de plâtre à coût réduit, visant à améliorer la résistance des maisons en torchis. Le produit fut un échec commercial : les individus préféraient bâtir de nouvelles maisons en brique plutôt que de renforcer les anciennes avec du plâtre. Les chercheurs du centre de recherche et développement de LafargeHolcim, à Lyon, se mirent donc à expérimenter afin de trouver un moyen efficace de mélanger le ciment et la terre pour fabriquer des briques. Au même moment, à un continent d’écart, une délégation gouvernementale à la recherche d’une alternative écologique aux briques cuites, cause de déforestation, approcha LafargeHolcim au Malawi. LafargeHolcim avait tout à coup trouvé un marché pour sa recette de terre-ciment. L’entreprise fournit donc rapidement un prototype de sa machine à presser les briques, qui servit ensuite à la construction d’une école financée par une ONG dans la capitale du Malawi. Les briques de terre stabilisée, lorsqu’elles sont bien faites, sont plus solides et résistantes aux intempéries que celles en terre cuite. Des études ont démontré que l’utilisation de blocs de terre stabilisée pour la construction d’une maison ou d’une école peut conduire à une réduction de 20 à 30 % du coût total du projet. De plus, étant donné la structure parfaitement uniforme de ces briques, les maçons sont amenés à utiliser une quantité moindre de mortier pour combler les fissures et décident souvent de ne pas recouvrir la façade de plâtre. Ce processus réduit la quantité de ciment utilisée, dont la fabrication représente environ 5 % des émissions mondiales de C0². LafargeHolcim développe actuellement une machine à presser des briques emboîtables, réduisant encore davantage l’utilisation du mortier. S’appuyant sur des recherches effectuées par une ONG spécialisée dans la fabrication de briques en Inde, l’entreprise affirme que les blocs DuraBric émettent 13 fois moins de CO² que les briques en terre cuite. De plus, elle estime que les BTCS émettent 20-25 % de la quantité de CO² dégagée par leur équivalent en béton. « Il s’agit de créer quelque chose d’abordable et de durable », déclare M. Perrot. La réduction des coûts est un point fort pour les constructeurs locaux, et, selon lui, les avantages environnementaux plaisent aux ONG. Dans le même temps, l’équipe de M. Perrot s’efforce de convaincre les élus locaux de promouvoir l’utilisation des blocs DuraBric pour la construction de bâtiments publics. Malgré tout, les difficultés existent. Il s’agit, par exemple, de convaincre les maçons qui ont depuis toujours bâti des maisons à l’aide de briques en terre cuite et de leur apprendre à utiliser la machine avec précision : si les proportions de terre, de sable et de ciment ne sont pas respectées, la brique produite peut s’avérer moins solide. Lors de notre visite de sites DuraBric autour de Mbeya, nous avons vu des piles de briques laissées à sécher au soleil, alors qu’elles auraient dû être protégées par une bâche, étape cruciale garantissant la rétention d’humidité dans la brique et une solidification adéquate de cette dernière. Lâchez l’une de ces briques séchées au soleil à hauteur de la ceinture, celle-ci se désintégrera dans un nuage de poussière au contact du sol. Si la structure d’un toit ou les fondations sont bancales, les meilleures briques n’y survivront pas. « Une brique est composée à 90 % de terre et peut s’éroder. C’est pourquoi il est primordial d’avoir un toit solide et un surplomb pour éviter qu’il ne pleuve directement sur les murs », explique Théophile Balay, chef de projet chez LafargeHolcim qui mène chaque semaine une inspection des machines afin d’apporter son aide aux maçons. DuraBric ne convient pas à tout le monde. 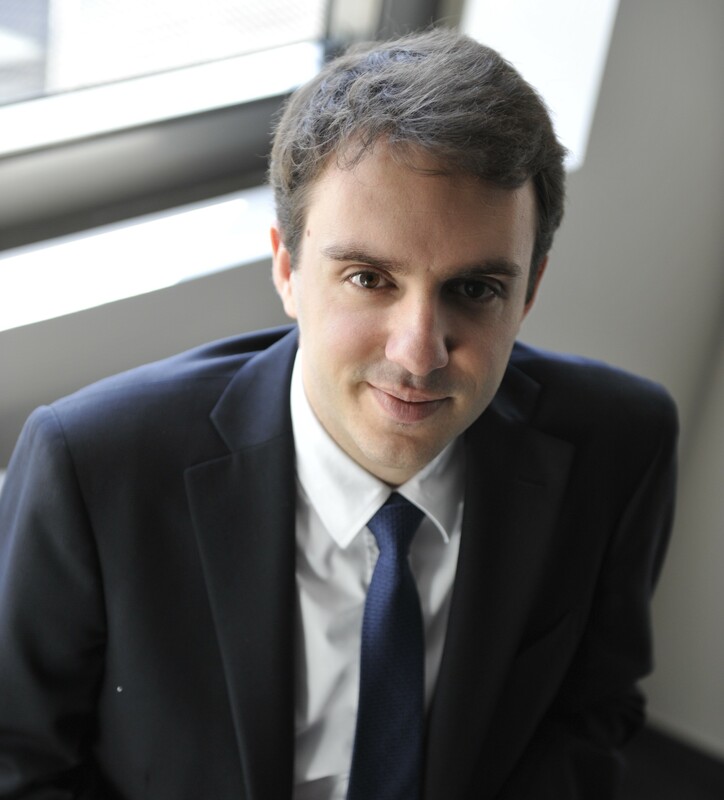 M. Perrot explique que dans certains pays, comme le Maroc, les gens préfèrent les blocs de béton aux blocs de terre. Cela étant dit, les avantages environnementaux de cette méthode ont été reconnus ailleurs en Afrique. En effet, ce type de brique a tant gagné en popularité que LafargeHolcim a démarré la construction d’une usine dans la ville de Lilongwe, la capitale du Malawi, dans le but de lancer leur production en masse : près de 10 000 briques par jour, assez pour construire deux maisons.